The year started off with a 5-week working holiday in Spain looking at Andalusia, the home of the Picaresque novels. (There’s a show in there somewhere.) The trip included a short return visit to Morocco and Portugal, then stopping on the way home for a meeting in Hollywood making it a Round-The-World Trip. Hitting all the holidays meant hunting up a restaurant that would be open on the day. After Christmas in Barcelona, there was New Years in Cordoba. The 6th of January is a big celebration in Spain and we were lucky enough to get to watch the parade from inside our warm Seville hotel lobby. A total of 52 hours and 15 minutes of flights then straight back into harness. It was a struggle to suddenly cope with the Australian summer heat after 17 degrees in Spain and Morocco, then minus 7 in Boston. Hollywood was balmy but don't know the exact temperature as they still have Fahrenheit (along with feet, inches and Trump – so quaint). In the first week back in Oz the gods took their revenge for us avoiding summer heat. They sent a heatwave. Of the eight performances that week – seven of them were outdoors. Excellent news: ‘Some Remarks Upon the Remarkable Art of Falconry’ was nominated for a Victorian Theatre Industry Award as ‘Best Puppetry’ in the Melbourne Festival of Puppetry. Our character ARLECCHINO seems as popular as ever. He got us invited back to Italian Festivals. The LA FIERA in Victoria, FESTITALIA in Queensland and the FERRAGOSTO Festival and NORTON STREET FESTA here in Sydney. Arlecchino also performed at two Medieval Festivals and fronted the show when we performed at Carlingford Library, the 244th Library we’ve performed at. During the year considerable time was invested in 3–5 minute duo acts (me and a puppet). There are now 30 of them in the repertoire, as well as seven awaiting audience testing and another eleven in draft form. Having recently done some Comedy Writing classes I’ve been ‘punching up’ my established scripts with what I’ve been learning. I learned a lot about verbal humour by researching old radio comedies. But the year ended happily with news from the International Ventriloquist Society that I won their Scriptwriting Contest and been named ‘International Ventriloquist Society Australian Ventriloquist of the Year’. The year started off with the usual round of school holiday performances. I was back at the marvelous ‘Australia Day Celebrations’ in historic Carcoar. At the end of the day I drove back to Sydney and the next day flew to Los Angeles for an international conference of family entertainers. While in Hollywood I met a retired producer and was privileged to spend several evenings peppering her with questions. She had worked with two of my Comedy heroes animator Chuck Jones and voice-over genius Mel Blanc, the voice of Bugs Bunny, Daffy Duck, Yosemite Sam, etc. I visited the graves of some of my other Comedy Heroes. These were comedians whose TV re-runs I watched as a kid. I thought they were funny then but it wasn’t until I starting getting into Comedy professionally that I realised what Comic Geniuses they were: Burns & Allen, Jack Benny, W.C. Fields, Stan Laurel, Buster Keaton, Ed Wynn, Mel Blanc, and the Marx Brothers. I also paid homage to my Hero Puppeteer, the late Walker Edmiston. He was a real inspiration to me. As a kid I watched his TV show religiously and was thrilled when at 10 years old I got to meet him and he very generously took the time to show me his character puppets. To this day when children ask me about my puppets, I always stop and answer them. Agricultural Shows played a big part in the year. Lots of travel; lots of driving; Gundagai, Tumut, Tamworth, Camden, Junee, Cootamundra, Gunnedah, Wellington, Dubbo, and West Wyalong. In May I performed at CURIOUS ACTS, an adult cabaret, at the Imaginarta Puppet Centre. I presented “Allenby’s FAMOUS Flea Circus” in the first half. Then rapidly setting up the puppet booth during interval, I did my Adult-Only production “Arlecchino and the Unfortunate Fart” in the second half. Originally it ran 38 minutes so I had to cut it to 20 to fit onto a cabaret evening. My ‘Delete’ key now reads ‘Kill My Darlings’. There was blood everywhere. Two new puppets joined the cast this year: “Kingsley the Lion” (named after one of Walker Edmiston’s creations) and a social media-obsessed bird named “Shrapnelle Korby”. She has her mobile permanently attached (literally) to her hand. Our latest production “Some Remarks Upon the Remarkable Art of Falconry” was invited to have its ’World Premiere’ at the Melbourne Festival of Puppetry in July. I was on a Double Bill with world-renowned shadow puppeteer, Richard Bradshaw. “Falconry” was originally scheduled to debut in September at the St Ives Medieval Festival. Going two months earlier than anticipated meant dropping all other projects to concentrate on “Falconry”. During the September school holidays performing at Dundas Library brought my lifetime total to 243 Libraries in four states. In October I was invited to perform Commedia dell’Arte puppetry at the huge FESTITALIA in Brisbane. Organised by the Italian Embassy, it is a massive annual celebration of Italian culture. It gave me AN EXTRAORDINARY WEEK ON THE ROAD: It began with the trip to Brisbane; then straight back and down to a St Francis of Assisi Feast Day in Canberra; followed the next day by a performance at a Bondi synagogue and finished up at a motor show in the Upper Hunter Valley. 3,500 kms covered; 121 Radio National downloads listened to. Every weekend in October was spent on the road. December saw the 3,000th performance of my Commedia dell’Arte comedy, “ARLECCHINO – FROG PRINCE”. Appropriately I performed it in the piazza at Leichhardt’s Italian Forum. Just after the school year finished up I spent the weekend doing eight shows in the Oval at the Mountie’s Club. Next day I flew off for a 5-week working holiday in Spain, Morocco and Portugal, stopping on the way home for a meeting in Hollywood..
Multicultural Diversity has definitely arrived, even in the bush. At the Bungendore Agricultural Show I encountered Sushi. At the Gundagai Show – a proper Italian coffee machine in the CWA rooms. At the Taree Show a Cypriot couple were serving great food. Even the tiny Batlow Show offered wood-fired pizzas. In Sydney we performed at a Jewish ‘Purim’ celebration and again for ‘Sukkoth’. We were also at the huge Islamic ‘Eid Show’ on the Bankstown showground. At christenings we got caught up twice in circle dancing. One was Assyrian, the other Macedonian. There was a diversity of weather too: 38 degrees at the Camden Show then a week later a mere 18 degrees maximum at the Tumbarumba Show. A diversity of cultural strata saw us one morning performing for a charity in the Far Western Suburbs and in the afternoon we did a show at a yacht club. Creative Development during the year brought to life our new character, Sebastian, a parrot that once belonged to a pirate. In a new routine Mrs Gilhooley, our Irish Red Hen, is a fortuneteller complete with a lit-up crystal ball. Toucan Tony was promoted to ‘Manager’ and got a new suit in the bargain. Our thanks to Sydney Puppet Theatre who built the Crystal ball and made Tony’s suit. Our new production “The Art of Falconry” was inspired by falconry displays at medieval festivals where we’ve performed. It’s been a chance to experiment with a 19th century style of humour based on the Comic Orators of that era. We’re using our Artemus Allenby character from “Allenby’s FAMOUS Flea Circus” with his Down East dialect and showmanship. The Highlight of the Year came about through Irish Luck. (I built my whole career on Luck.) A friend who works at Ireland’s Trinity College asked if I would like to house-sit for her when she went on holidays. So I spent three weeks of the northern summer wandering about Dublin, taking in the culture and listening to the creative Irish use of English. After that I needed a holiday so I went to Lisbon to see if my study of the Portuguese language was a waste of time. (It wasn’t – Graças a Deus) The ‘Museo de Marionetas’ there was wonderful. ANECDOTE OF THE YEAR: In The Pram Show Dreadley the Monkey will only do his dance if I promise him a banana. At the end of the act many children call for him to get his banana. I explain that he’ll have his banana when he gets home otherwise he makes a mess in his box. One day after I had packed up the show and was heading out the door, a little girl with a keen sense of justice ran over and sternly reminded me I was to give Dreadley a banana as soon as I got him home. I spent some time re-reading my books on PUPPET HISTORY, especially looking at the fairground tradition, To me the most striking aspect of the books was how hard the lives of these performers were. Coping with censorship, adverse legislation, exposure to the weather, opposition from the Church, high crime rates, social snobbery and generally hard economic times meant a difficult, marginalised life. I try to remember that when I catch myself grumbling about all the driving I have to do – in an air-conditioned vehicle? – with power steering? – with Radio National downloads? – with cruise control? What a total wimp. Shame on me. NEXT YEAR: We are off to the United States for a family entertainers’ conference. Then soak up some Southern California lifestyle and meet up with some puppeteers. Not having been back to California for 40 years, I expect it will freak me out a bit. If it doesn’t, a visit to Las Vegas certainly will. The year started off, as always, with a flurry of shows in the January school holidays performing at a wide variety of libraries and vacation cares where we introduced some new short comedy acts. In March we toured to Melbourne for our annual appearances at primary and secondary schools with our Commedia dell’Arte programme. And we got to catch up with puppeteer friends. While we were in Melbourne, Basil “Gypsy” Smith, retired Punch & Judy Man, completely remodeled our Library/Rehearsal Room, installing a system of trolleys that can be wheeled out of shot or out of the way of books. He even managed to put in an additional 8 metres of bookshelves. Irish Luck let us evade by a whisker the “April Showers” that hit NSW. On the way back from the Gunnedah Agricultural Show we drove through the Hunter Valley. A few days later it was hit with a cyclone. A few days before we were to perform at the Bellingen Show, flooding put the bridge underwater, cutting the town in two. It re-opened in time for our arrival and the Show went on. Later in the year we had five weekends in a row working outdoors and got rained on twice. At the Shows we do both Roving Puppets and glove puppet booth shows. Temperature and the availability of shade make a big difference to the size of audience we get. Making uncomfortable people laugh and forget their discomfort is very gratifying. In August our loyal Puppet Van after 9 1/2 years of service and 282,800 kms blew a gasket. Being a real trouper it limped on to get us to three more shows before we had a lull in the performance schedule to organise a new van. The new van was delivered on a Friday and by the next Thursday was already up on the NSW/QLD border back of Moree. Several new puppet acts passed their audience-testing phase and entered the Official Repertoire. These included Mrs Gilhooley the Hen’s ‘Amazing Trick’, Chester Chook the Magnificent Magician, SuperChook and ‘Duck Talent’ with Dudley Duckeley. Several feature in our new Show ‘TOUCAN TONY’S REALITY SHOW’ which debuted in November. It’s a send-up of the so-called Reality TV shows. New characters, yet to be developed and tested, came aboard. They include Sebastian, a parrot who once belonged to a pirate, a Talking Pizza and a Zombie whose body parts keep dropping off. THE NICEST COMPLIMENT OF THE YEAR: ‘Italian Day’ at West Pennant Hills Primary School featured lots of activities; cooking, games, dance lessons, our Italian puppet show, singing etc. At the end of the day the children were asked which was their favourite. Our show was voted ‘The Best’. We even out-polled Chocolate Salami(!). January started the year off with a round of vacation care centres, libraries and agricultural shows. We particularly enjoyed doing our Commedia dell’Arte shows as part of the PARRAMATTA RIVERSIDE FORESHORE. JANUARY 22, 2014 was a MILESTONE DAY. We performed our 11,000th show (lifetime total) and it was at our 238th library (lifetime total) (241 by the end of the year). As MURPHYS PUPPETS’ official patron, Lady Hortense O.B.E., T.B.A., once said “Passing a milestone can be a very painful experience.” We think she meant ‘kidney stone’. Maldon Puppet Carnival in Victoria took place in March in the middle of our Victorian school tour. (How’s that for planning? Less driving!) It also meant that as well as carrying our primary and secondary Italian Studies school shows, we also had to squeeze into the van all the puppetry booked by the Carnival: two Cabaret acts, an assortment of Roving puppets and our pre-school show The PRAM SHOW.It was a great festival and a rare chance to catch up with other puppeteers. We continue to perform regularly at the ART GALLERY OF NSW with Commedia dell’Arte puppetry. In the September school holidays we were there to coincide with an exhibition of European prints and drawings 1500–1900. It’s a great venue. Ah, the luxury of being indoors and having a lift and a parking spot! The demographics are such that for every child watching there are five or six adults. It makes for a very diverse audience and any throw-away quip, no matter how obscure, is always picked up by someone. NEW CAST MEMBERS: We welcomed three new characters to our stable this year. A man-eating plant illusion joined our Roving Puppets crew. Chester the Chook and Ambrose the English Mole from Yorkshire. We took ‘Out Ambrose’ to Tasmania for a four-day intensive Accent Workshop with native Yorkshireman, Basil Smith, a retired Punch&Judy man. January saw us back on the Agricultural Show circuit after a 10 year hiatus. We got an urgent call from a show to fill in for a puppeteer who had taken ill. So after hours of doing Roving Puppets at Australia Day celebrations, we headed straight for the country to be ready the next morning for a day on the Showground. They booked us again for 2014 and we are now back on the Agricultural Show circuit. Our school tour to Melbourne coincided exactly with their Record Heat Wave. Luckily it also coincided with Dream Puppets’ housewarming for their new premises so I was able to catch up with other puppeteers without venturing out into the heat. We had a call from ABC Radio on April Fools Day. They were following up a story from Germany about a flea circus owner who lost all his fleas in a sudden frost. As proprietor of Allenby’s FAMOUS Flea Circus, I was interviewed about the history of flea circuses. It was great tongue-in-cheek fun. We celebrated Pinocchio’s Birthday performing at an Italian restaurant in Wollongong. While NAPLAN testing was going on in Sydney there were no school bookings to be had so we went off to do THE PRAM SHOW at preschools in Canberra. BIZARRE SECTION: a “KIDDIE’S ENTERTAINMENT” – type TV show rang looking for a puppetry coach. It’s the type of show I deplore – presenters talking down to the children and over-acting as if they were speaking to morons. (DEAD GIVEAWAY: They smile with their mouths open.) Kids are smart and don’t need ham acting to ‘explain’ what’s going on. As it was, it turned out they had only a miniscule budget for Puppetry – despite the fact that they fly the entire crew to Singapore to film the shows. Not to mention all their spin-off merchandise targeting young children. The June/July School Holidays had us on the run with 32 performances across six different productions and driving 2,083 kilometres to accomplish it. • We were invited back to the Queensland Theatre of Puppets (QTOP) for the Qld school holidays where we did a week of “MAGIC LAMP” and a week of “PUPPET TRICKSTERS”. • Then a weekend dash got us back to Sydney in time to do shows during the second week of NSW holidays. One of the advantages of living in a multicultural country is the variety of food available. One Sunday at a festival we ate Spanish paella and Korean BBQ. The next Sunday at another festival we had Mexican nachos and Nepalese dumplings. In the week in between we were at a country agricultural show where the menu was reduced to sausages and steak sandwiches. Can’t win them all. IL DOTTORE: Congratulations, signor Pantalone. I would like to shake your hand. OLD PANTALONE: No need, sir. It shakes all by itself. We are touring Rural Victoria with some time in Melbourne. We will visit Griffith and New England with school shows, perform at a variety of agricultural shows and are really looking forward to the Maldon Puppet Carnival in Victoria. Well, that year went very quickly. We had challenging audiences like special schools and the Scalabrini (Italian) Nursing Homes. We had varying venues from the Muswellbrook Showground to the Royal Sydney Yacht Squadron. We performed for the Kannada Society. We were invited back to our ‘regular’ festivals like Italy-in-Broke, Bondi Beach’s Festival of The Winds, Newtown Festival, Norton Street Festa, etc. and played for the first time the Strathfield Spring Festival, Euro Festa 2012, Tarrengower Puppet Festival, and the Kings Cross Festival. We added seven more libraries to our lifetime total, bringing it to 237 different libraries. ‘Wintering on the Gold Coast ’, we played a two week season at the Queensland Theatre of Puppetry. We had nearly full houses when it was raining and absolutely FULL HOUSES when it was sunny. We took a Busman’s holiday to go to Prague where we saw a lot of puppetry. We were particularly taken with the Spejbla and Hurvinek Puppet Theatre, catching four of their shows. We were very generously given an extensive backstage tour and met the performers – and the puppeteers who operate them. Their theatre is a converted cinema with lots of space to display puppets from the 80 years they have been going. We went on to Italy to do more research into Commedia dell’Art e puppetry with Paolo Paparotto, a puppeteer in the Veneto region who specialises in the Arlecchino and Pantalone characters. Any free time during the year was taken up by writing and rehearsing with some new characters like Dudley Duckeley the Duck Comedian and Mrs Gilhooley the Hen. They will join the ‘flock’ of bird puppets we use as Walkarounds and support acts. These include Dumm-Dumm the Dodo, Howard the Hypochondriac Hawk, Pretty Boy the Budgie, Toucan Tony and our ever-popular Gunther the Pelican. Our thanks go to Toongabbie Public School’s Before & After School Care who have been our test audience for the last two years. Down to the South Coast, Up to the North Coast, Out to Dubbo, Over to Canberra, and Off to Melbourne. Our newest puppet character, Toucan Tony, made his debut in the January school holidays in one of our vacation care/library programmes. 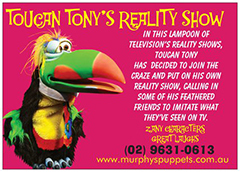 Tony is “on the run” after escaping from the zoo and is hiding out among the other bird puppets in the show. His Brooklynese accent and Damon Runyon-esque syntax (“Dey ain't built the boidcage yet what can hold Toucan Tony!”) made him an instant hit – “instant” despite the fact that his character was the result of months of development. At the end of the Melbourne tour I had to shoot straight back to Sydney to perform the next day for International Commedia dell'Arte Day – a world-wide event to celebrate one of the oldest surviving traditions of Western Theatre. • It was also an opportunity to show support for the Italian government's nomination of Commedia dell'Arte to be a UNESCO “Intangible World Heritage”. • FIPS – Fools in Progress organised the Sydney celebrations. Other cities involved were Bologna, Washington DC, Jerusalem, Orleans, New York, Buenos Aires and even Addis Ababa. Evviva la Commedia dell'Arte!! I was in western Sicily for Easter to see the Holy Week processions and do some research into traditional Sicilian Puppetry. • While in Palermo I visited the Museo Internazionale delle Marionette, taking them a parcel of photos and a biography of the late Giovanni Bronzino. Giovanni was a Sicilian-born Sydney puppeteer who built an entire traditional Sicilian puppet production in a shed in a Marrickville community centre. • Giovanni grew up in Palermo watching the pupi siciliani. While his friends were off at the beach, he would be pestering puppeteers with questions or visiting museums. As much as he loved Sicilian culture, there were few opportunities for employment, in or out of puppetry, so like millions of Sicilians before him he emigrated. He went first to Rhodesia where he saw a travelling Sicilian puppet company – from New York no less. That planted an idea in Giovanni's fertile mind. • He moved on to Sydney and when he wasn't carving furniture for a living, he was building up a complete Christian army and an opposing Saracen army, all in full chivalric armour. I met him one week before an SBS-TV crew were coming to make a programme about him and he needed a second person to operate the puppets. When I introduced myself as a puppeteer who speaks Italian, I was immediately put to work, by-passing the traditional years-long apprenticeship. • Palermo's Museo Internazionale delle Marionette has a wonderful collection of puppets and have undertaken a project to document puppetry from around the world. They were astonished to learn of Giovanni's work. • From Sicily I flew to the diagonally opposite corner of Italy to visit friends in Trieste. While Sicily has remnants of ancient Arab and Greek cultures, Trieste has Venetian, Austrian and Slav influences. Quite a contrast within one country. The most momentous Event of the Year was our 10,000th performance It took place during “LIBRARY WEEK” when we also clocked up our 230th library. Janice spent years puppet-building, taking bookings, doing the accounts, etc., etc. A lot of credit also goes to “Lady Luck” and I will always be beholden to puppeteer friends who gave me advice, criticism and encouragement over the years. I am returning to Italy to do more research into Commedia dell'Arte puppetry with Paolo Paparotto, a puppeteer in the Veneto region who specialises in the Arlecchino and Pantalone characters. One of the highlights of my career was performing beside him up on the ancient city walls of Treviso. Spike the Baby Dragon: Thanks to the popularity of the movie “How to Train Your Dragon. ”, Spike did his mind-reading act at seven libraries during one week of the April school holidays. The Art Gallery of NSW had us back performing regularly through the year as part of their “Sunday Family Programme”. Allenby’s FAMOUS Flea Circus had a two-week season at the Powerhouse Museum. Their art-deco cinema was the perfect setting for the show but having only 52 seats and full houses for all performances, we had to move to the bigger 97 seat Target Theatre. We still had Full Houses for every show but at least we turned away fewer people. Ringmaster Artemus Allenby chatted and joked with people out in the queue – a great opportunity to develop the character. Festivals took up many weekends. We were back at the Newtown Festival, The Scarecrow Festival, FERRAGOSTO, Bondi’s Festival of the Winds, etc, etc. Southeastern Europe: I took April and May off to go to Southeast Europe and wait out the Global Financial Crisis while enjoying Spring. Rather than chase up puppet theatres, I decided to concentrate on my other obsession – Balkan History. But my resolve collapsed on the second day. • In Istanbul’s Book Bazaar, I came across a copy of Professor Metin And’s book, “Karagoz - Turkish Puppet Theatre” and spent my evenings reading it. I saw an excellent marionette production of “ Hansel & Gretel ” at the ancient St George’s Day Festival in the Transylvania region of Romania. I was surprised at the large number of puppet theatres still going. Returning to my hotel on a late night tram in Timisoara I spotted no less than two puppet theatres along the route. • The theatres still employ a large number of puppeteers. One show had ten! (yes, 10!) Wages are low and puppeteers, like most Romanians, hold down two or three jobs to get by. Despite the political upheavals in 1989 when Communism fell, the puppet theatres continued to receive government subsidies and didn’t suffer that much. Until, that is, this year: drastic European Union-mandated cutbacks are expected to have grave consequences. European Languages Day: The Italian Institute of Culture invited us to participate in this project to promote the study of European languages. Dr. Balanzone, our Commedia dell’Arte quack doctor, gave a dissertation on the beneficial properties of ‘Balanzone’s Miracle Elixir’, the sovereign remedy for Nervous Debility. He presented it to a rather astonished audience at a physicians’ conference. No sales ensued. Touring took us to Melbourne, the NSW South Coast, Canberra and towns around Narrabri and Armidale. Libraries: Our Lifetime Total of “Libraries-Performed-At” reached 223 with the addition of the Mount Druitt and Stanhope Gardens libraries and the official opening of Warrawong’s new library. Touring will take us to the Riverina, Tasmania, Queensland and Victoria. We will go to western Sicily to witness the Holy Week processions leading up to Easter and to do some research into traditional Sicilian Puppetry. We will also be performing in International Commedia dell’Arte Day. The year began, as always, with hectic January school holidays and plenty of ‘dashboard dining’ – eating ‘a la car’. No sign of a Global Financial Crisis. The first half of February, as always, was Maintenance Time, going through all the puppets and staging looking for wear and tear. My partner, Janice, is meticulous in her sewing and construction so few repairs were needed. With everything refurbished and ready by mid-February I was off to Melbourne. The “Prudential Children First! – Singapore International Festival for Children” is an 11 day festival that was celebrating its 10th anniversary with an eclectic mix of 12 productions from eight countries. Run by ACT3 International, a Singapore-based arts group, it’s the only festival of its kind in the region. Like all of Singapore it was meticulously organised and amazingly efficient. Among the things given to me on my first day was a detailed memo about my last day – what time to check out of the hotel, what time to be ready for pick-up to go to the airport, even the limo’s licence plate number. But efficiency did not make it a humourless affair – far from it. Laughter and banter between shows provided a beautifully friendly atmosphere. I had a wonderful time, ate very well and explored some excellent museums in my spare time. Back home I did a June tour to the Riverina. In September I worked my way up the north coast of NSW with high school shows. In-between we performed at two Italian festivals: the inaugural “La Fiera” Italian Festival in Myrtleford, Victoria and “FERRRAGOSTO” in Sydney. After visiting so many museums in Singapore we ended up in a museum ourselves! The Powerhouse Discovery Centre ‘discovered’ us and booked both “THE PRAM SHOW” and “Allenby’s FAMOUS Flea Circus” for their July school holidays programme. October school holidays had us back again for a season at the Art Gallery of NSW. BIGGEST COINCIDENCE OF THE YEAR: At the end of the children’s festival in Singapore the organisers invited me to fly back up for a festival in September. Unfortunately, the date conflicted with our long-standing annual booking at Bondi’s Festival of the Winds, a kite festival. The Singapore organisers were intrigued because their festival was also a kite festival. When I mentioned this to the Bondi organisers they told me that every second year there were fewer kites in the sky over Bondi because of an international kite festival in France. – all on the same weekend. Uncanny. Touring will take me to Melbourne in Feb/March then for the rest of the year I am touring in NSW only. I will, however, be off on another “Springtime in the Balkans” trip. Last time it was the Yugoslav successor states. This time it’s Bulgaria and Romania. Along the way I will catch a few puppet shows, eat well and amuse the locals with my rather idiosyncratic Romanian and Bulgarian language skills. Our thanks go to the people who booked us in 2009 and to the hundreds of audiences that put up with our brand of silliness. In March I drove the puppet van to Adelaide and put it on the Indian Pacific for the train journey across the Nullarbor. (NSW tunnels are too low to carry vans, otherwise I would have happily trained it from Sydney). Our production, “Allenby’s FAMOUS Flea Circus”, was invited to perform at the 20th UNIMA International Puppet Festival and Congress in Perth. It was a wonderful opportunity to see overseas shows and catch up with fellow puppeteers. UNIMA International Puppet Festivals are held every four years. I had been to them in Slovenia and Hungary but this was the first time it was held in Australia. Before the Festival began I did a 3 week tour of Perth primary and secondary schools with our Commedia dell’Arte programmes. I had to hit the ground running when I flew home as all my school regulars from Terms One and Two were crammed into the last three weeks of Term Two. Then it was school holidays. Then a tour to Brisbane. Then smack into Term Three. The lovely white cane pram that supports “THE PRAM SHOW” finally retired after 23 years of service and numerous welding repairs. I bought it for $10 as a second-hand pram and used it for so long it became an antique. I have had another identical pram standing by for years and now that one is in service. Assuming it too lasts 23 years, I may only need 2 or 3 more standing by to see me out. The Art Gallery of NSW continues to book us, bless their collective hearts. We also played return bookings at the Norton Street Festa in Leichhardt and the massive (estimated crowd of 80,000) Newtown Festival. It was that festival’s 30th year. Also celebrating their 30th anniversary was our favourite, Bondi’s Festival of The Winds. Over the years we have played 22 or 23 of them. Touring will take us to Canberra, the North Coast of NSW and to schools in the Riverina that teach Italian. Our Tour of Victoria will have to be be in two parts; interrupted by a eleven-day stint at the 2009 Singapore International Festival for Children. The year began ‘on the run’ in January school holidays with shows all over Sydney as well as many performances on the Central Coast. Besides regular appearances with ‘Gunther the Pelican’ at The Entrance, Australia’s Pelican Capital, we have regular bookings at a resort up there. Because the kids are up early our shows begin at 9am. Which makes for a very early start from Sydney. We missed a performance (an extremely rare event for MURPHYS PUPPETS) when raging bushfires closed first the motorway then the old road and we were forced to turn back. Puppetry means a lot of driving (6,000 km in January alone) so it’s inevitable that we should eventually run into hazards. We hit another hazard on our way back from one of our favourite festivals, Deniliquin’s SUN FESTIVAL. We were involved in the Cootamundra Silo Emergency. A fire in a grain silo threatened to cause a gas explosion so a detour and an exclusion zone were set up. It should not have affected us passing through town but we stopped for coffee then found we had a flat battery. The NRMA responded quickly and determined that a new battery was needed. They had plenty back at the depot - but the depot was inside the exclusion zone! They had to get special permission to go in for the battery. Other festivals re-visited this year were the massive Newtown Festival, Bondi’s Festival of the Winds, AUSTRALIA DAY in Armidale and the One Van Puppet Festival. We were again part of Darling Harbour’s “HOOPLA!” Festival of Circus and Street Theatre at Easter. School tours took us to Tasmania, Broken Hill, New England and Melbourne. Libraries, as always, were a big part of the year. We did a tour of Upper Hunter libraries where Merriwa became our 217th library. The other Career Total Milestone this year was our 9am performance on November 14th at Woollahra Public School. It was our 9,000th performance!! But there was no time then for celebrations as the show was immediately followed by another performance at 10am, another at 11:15 and one at 1:30 – bringing the total to 9,003 by the end of day. We had a very memorable year filled with a variety of venues, and some great audiences. We will perform at the UNIMA2008 International Puppet Festival in Perth. Then we have just a week to get the van back home in time to fly off to Southern Europe for two months doing research in Italy and exploring the Balkans (Europe with an edge). Brisbane and Melbourne are on the agenda later in the year. 2006 began at the Art Gallery of NSW on the second anniversary of our first performance there for the Caravaggio Exhibition in 2004. We’ve been going back regularly ever since. This year we’re doing ‘Sunday Funday’ performances in January, March, July and August, as well as the June long weekend and a week of shows in the October schoolholidays. After giving nearly a thousand shows at The Rocks Puppet Cottage from 1992 to 2005, we were back performing in The Rocks when the Historic Houses Trust had their “Grandparents’ Day” at the Susannah Place Museum in April. The next week we spent four glorious days over the Easter Weekend as part of Darling Harbour’s “HOOPLA!” Festival of Circus and Street Theatre. There were some great acts on the bill with us but we had five performances a day so we didn’t get to see any of them. An outlet for all the accent study I’ve been doing is the announcement on our answering machine. The phone has been answered with Cockney, Yorkshire, Southern Irish and Belfast Irish, Standard British and Liverpudlian. From the US we’ve used Down East (New England), Brooklyn, Manhattan and Ozark Mountain accents. Occasionally we let a puppet answer. It’s all terribly confusing for the Indian call centres ringing us. New WALKAROUND characters include ‘Harold the Hypochondriac Hawk’ and ‘Wahoo’ who is half fur and half feather. We really don’t know what Wahoo is. More libraries were added this year to the MURPHYS PUPPETS life-time total. Stanmore Library became our 214th library. After a mere 273,000 km, the old MURPHYS PUPPETS van gave up the ghost. The next day’s schedule called for five performances of two different productions at three different venues so the race was on for a replacement. The new MURPHYS PUPPETS van has air-conditioning and power-steering. Unfortunately it still requires me to do the driving. At least its MP3 player gives me 24 hours of downloaded ABC Radio National programmes to ‘shorten the road' as the Irish say. 2006 Touring takes us to Northern NSW and Adelaide as well provincial centres like Griffith and Melbourne. Thanks to the Sydney-to-Tasmania and Tasmania-to-Melbourne car ferries we have managed to go to Melbourne three times in the past two years without having to drive the Hume Highway. As always, our greatest privilege is returning to our ‘regulars’ – the kindergartens, libraries, vacation care centres, primary and high schools who book us every year. A very productive year. Between performances over Christmas and the January School Holidays I got to work on a re-write of our latest comedy, “THE TWIN CAPTAINS”. In February I took the new show with me when I went to Tasmania to perform for Terrapin Puppet Theatre. I wanted to get critiques of it from an English puppeteer and a Czech puppeteer now residents of Hobart. After more cutting and pasting, pruning and weeding, it is finally ready for next year’s launch. While in Tasmania I also picked up a beautiful new glove-puppetstage built of western red cedar by English Punch&Judy man, Basil Smith. The stage will give me more flexibility for theatrical effects and scenery. But it also meant that before I could bring it home I had to do my tour of Victoria with the new stage suspended from the ceiling of an already jam-packed puppet van. “Passing a milestone can be a very painful experience. There has been a population explosion among our Italian-style Commedia dell’Arte glove puppets this year. We are introducing an early traditional character, ”Tartaglia”, who will become the downtrodden accountant to the old miser Pantalone. We also now have a Mrs.Pantalone and a new ‘Feral Godmother’ for the comedy “TO THE RESCUE”. Twenty different characters now cavort through our six Commedia shows. states that a repeat booking is the sincerest form of flattery. So we were very pleased to return again this year to some of our favourite haunts – we were back at the Art Gallery of New South Wales for school holiday shows and for their Sunday afternoon ‘Funday’performances. We again played the Italian cultural festival FERRAGOSTO when Five Dock closes off its main street converting it into cafes, market stalls and stages. We performed for the ‘umpteenth’ time at Bondi Beach’s Festival of the Winds and played Young’s “National Cherry Festival” for the third time. But our greatest privilege was returning to our ‘regulars’ – the kindergartens, primary and high schools where we perform each year. 2005 took the puppets to Victoria, western NSW, Tasmania, Queensland and Canberra chalking up 36,000 kms – It was a great year, if you don’t count all the driving. In 2004 our performances ranged from our evergreen pre-school production, THE PRAM SHOW now in its 20th year, to adult Stand-up Comedy at the One Van Puppet Festival’s cabaret night. In January we presented our Commedia dell’Arte Puppetry at The Art Gallery of NSW as part of the “CARAVAGGIO & HIS WORLD” Exhibition of Italian paintings. We had a two week season plus Sundays in January and February. We were then asked back again to do Sunday performances in April, August and October as well as another week’s season in the October school holidays. (When performing Commedia dell’Arte in the Art Gallery, the question most often asked is; “Where are the toilets?”) The audiences represented a wide range of people. So much so that every one-liner, no matter how obscure the reference, got a laugh from someone. Touring took us far afield throughout the year. Loading the primary and secondary schools, we were off to Melbourne (a biennial event), NSW Outback, Riverina (a week of Italian Studies shows in Griffith is a biannual event), four weeks in Tasmania with a chance to visit puppeteer/friends and eat seafood. Two weeks in Adelaide in Spring, a week in New England and another in the Hunter. The sad news was the closure of The Rocks Puppet Cottage. We had the great privilege of being ‘Guest Artists’ there since it opened in 1992; performing some 840 times, meeting thousands of people from around the world and presenting 12 different productions – many having their ‘World Premiere’ at The Cottage. We greatly miss the place as do, no doubt, the 30,000 visitors who came through each year. In brighter news we were particularly chuffed when our “Frog Prince” was chosen for “The Spike Fest” which celebrates the life and work of one of our heroes, comedian Spike Milligan. 2004 was a terrific year for us; getting to perform to 456 different audiences and meeting some amazing kids. * Taking our fourth production to the Art Gallery of NSW in March and April. * “Guest Puppeteers” at The Rocks Puppet Cottage when it re-opens temporarily in the January School Holidays. In January we will perform at the opening of the new East Maitland Library. It will be the 191st library MURPHYS PUPPETS have appeared at. Jakers!!! !